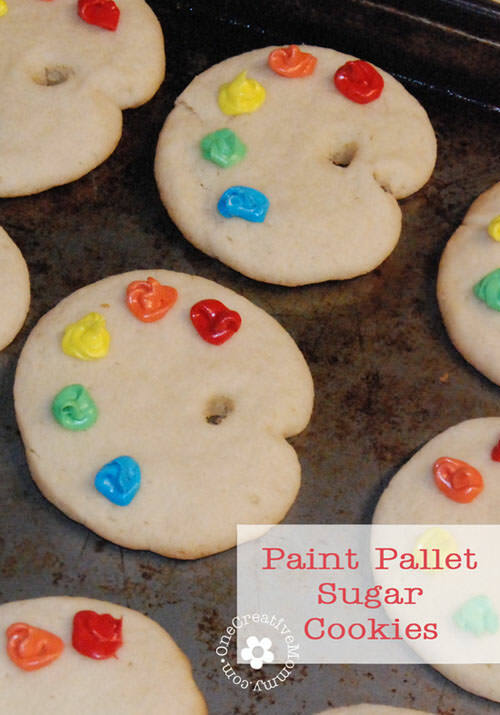 It’s time for another art party project post: Paint Pallet Sugar Cookies! Prepare your favorite recipe of sugar cookie dough, and roll it into a tube. (I used a cookie mix from Betty Crocker–it was the night before the party, and I still had tons of projects to finish! Turns out that Betty Crocker makes yummy sugar cookies!) Refrigerate the dough for about 10 minutes so that it will keep it’s shape as you work with it. Use some type of rod (I wrapped my knife sharpener in paper towels) to press a dent into the top of the dough. This dent will mimic the notch in the paint pallet. Make your dent much larger than you think it should be. I made mine just the right size–but it shrank when the cookies baked. I should have made it deeper. Refrigerate the dough again so that you can cut it. 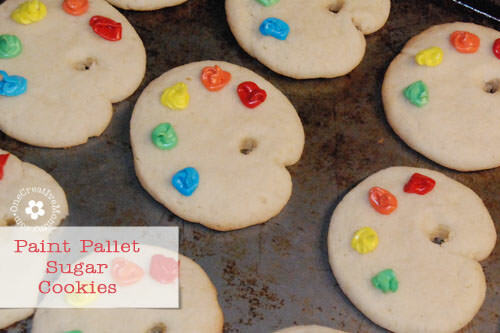 Slice the dough into 1/4″ cookies and lay the shapes on a cookie sheet. (Grease or don’t grease the pan–depends on your recipe.) Use a wooden skewer (the kind for grilling) or a flattened straw to poke a hole into the dough just above the notch. Again, this hole will shrink. Make it bigger than you think you will need. Bake the cookies according to your recipe, and allow them to cool before you remove them from the cookie sheet. If your holes have disappeared, you can quickly make a new hole if you do it immediately after removing the cookies from the oven. If they start to cool, it’s too late to use the skewer. You may be able to punch a hole with an unflattened straw, though! Cut a very small notch in one of the bottom corners of the ziplock. It’s easy to make it bigger, but impossible to make it smaller! Be sure that your cookies are completely cooled, and lay them back out on the cookie sheet or large plate. Beginning at the top or bottom corner a cookie, gently squirt a dab or swirl of frosting. 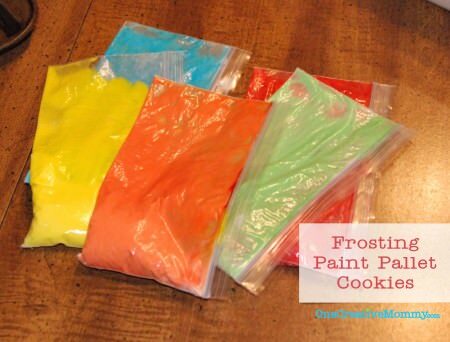 Continue with each cookie, and then move onto the next color. Repeat with each color, and you are done! I am kicking myself that I forgot to take a picture of the finished plate of cookies. (I’m certain there is a memory card hiding somewhere that includes pics of the finished cookies and of the frosting process.) They definitely did not turn out perfectly like J’s, but the kids loved them anyway, and I thought the homemade, imperfect look was just fine. 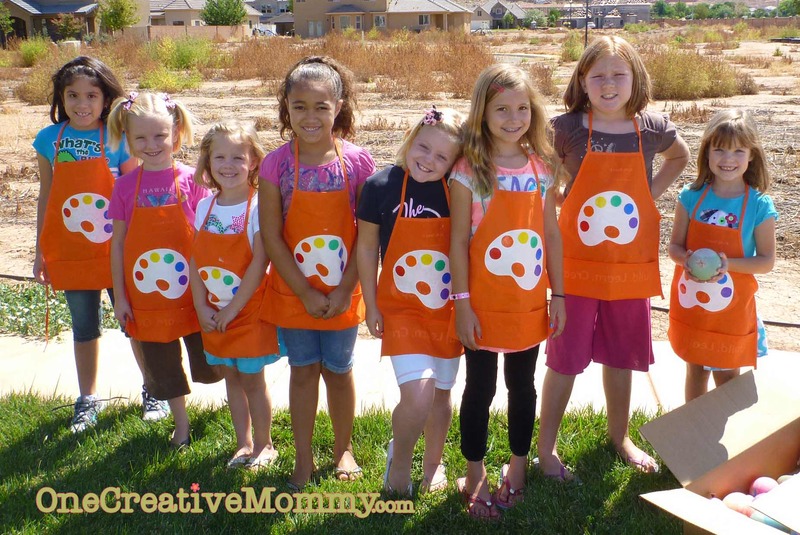 They matched the kid’s art aprons perfectly! 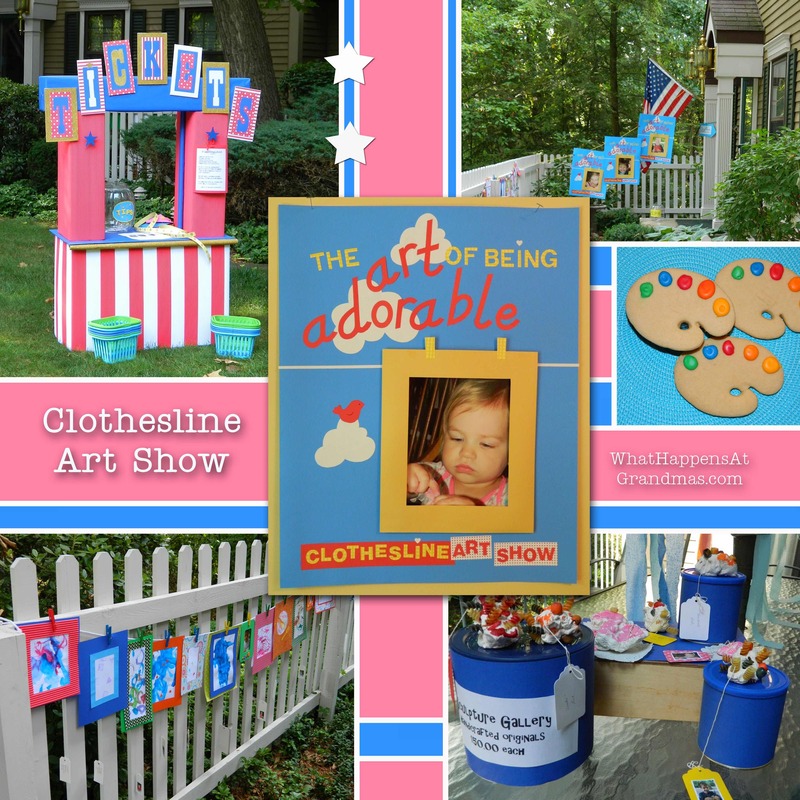 Heidi, Thank you so much for your generous and kind acknowledgement of my art show! You made a wonderful adaptation of the cookies! Your aprons are very clever too, and I can tell by the picture that those little girls had a great time at your creative event. I am going to subscribe now so I don’t miss a single idea of yours. We might have to offer the paint can pinata at next year’s art show! I love it! And I am always glad to help in any way I can. Bless you! You are so kind! You made my day. Thank you. Thanks so much! I’m on my way to check out your site! Oh my gosh this is awesome! Totally pinned so I can brainwash my daughter into her next birthday theme. I’m glad you like it. I’m headed over to check out your site. Thanks for commenting. These are so cute! And the perfect thing if you’re ‘art mom’ at school! What a super fun idea! Love this! Thanks so much for sharing at Mom On Timeout! Be sure to come back. I’ll be posting more activities from the party soon. Thanks for visiting and commenting! These are adorable! 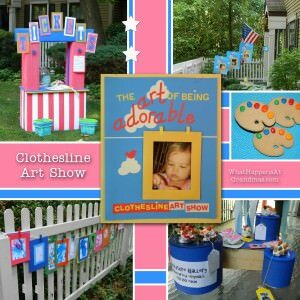 I did an artist themed party for my daughter last year and it was a big hit. I just made an artist pallet cake, but the cookies would have been great to have too. Great job! Have a lovely week! Your cookies are so cool! LOVE these!!! I’ve pinned, tweeted and facebook liked them! I’ve got to make these for my next painting party. Those are so stinkin’ cute! I love how they turned out! Makes me want cookies for breakfast. Thanks for sharing at the Pomp Party! Pinning! I think I probably had a few for breakfast! Super cute cookies! I wonder if I can talk any of my kiddos into having an art party? those cookies are absolutely adorable! I love the idea of an art party! I’m on my way over! We did an art party for my daughter two years ago and it wasn’t nearly as cute as this. These cookies are precious! I found you at Too Cute Tuesday. I LOVE these, Heidi! They are too cute! Those are just too cute! Thanks for sharing at The Fun In Functional! Such a cute and fun idea! I love the “paint” on the pallets! The aprons look awesome too! Thanks for sharing at Gettin’ Krafty! 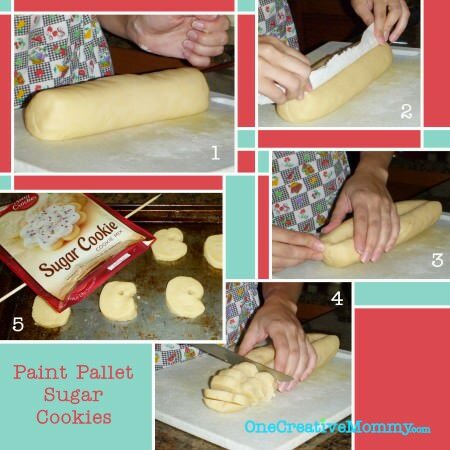 Great idea for those cookies! These are the cutest thing! You have so many great ideas, Heidi! I have an 11 yr old who is an aspiring artist – he would love these! Thank you for sharing at All My Bloggy Friends last week. I can’t wait to see what you share this tomorrow! Your cookies turned out so cute. Thanks for sharing on Tout It Tuesday. Hope to see you tomorrow! I saw these cookies on Delightful Order’s link party. They’re absolutely adorable.